Usborne Library of Fear | Vault Of Evil: Brit Horror Pulp Plus! The last thing I remember is the sight of the severed hand dragging itself across the floor to within inches of my neck. Its middle finger slowly extended, and a yellow, claw-like nail touched my skin. 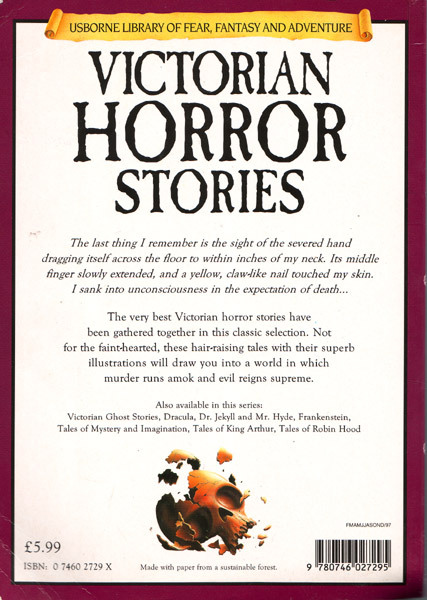 The very best Victorian horror stories have been gathered together in this classic selection. Not for the faint-hearted, these hair-raising tales with their superb illustrations will draw you into a world in which murder runs amok and evil reigns supreme. Long before the current Stephen Jones - M. R. James Paragraphgate scandal, there was a similar controversy surrounding the alleged dumbing down of classic ghost & horror stories to make them more accessible for children. 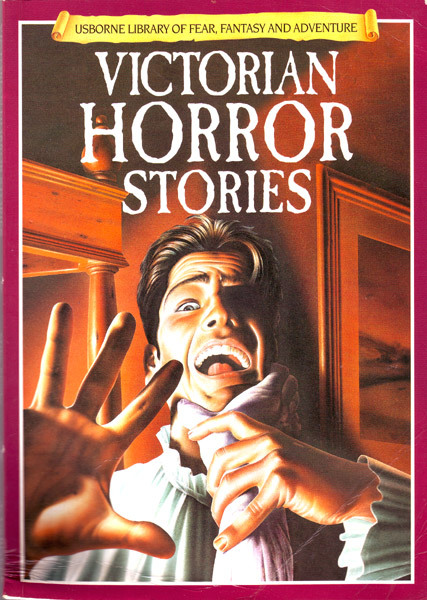 For all I know, you probably can find txt versions of Dracula & Co, but Usborne haven't gone quite that far if Victorian Horror Stories is typical of their output. It's the easiest thing in the world to dismiss what you've never read and, must admit, am not sure I like the idea of anyone tampering with Mary Cholmondeley's Let Loose, but two stories in and Mike Stocks is playing a blinder. One Silver Bullet: A reworking of The Severed Arm, or The Werewolf of Limousin, as reprinted in Peter Haining's The Shilling Shockers/ Tales From The Gothic Bluebooks, with Mr. Stocks relocating the action to Liverpool Street Station and environs. The Head Of Jean Cabet: Martin Desalleaux, public prosecutor of Beaugency, is not a man to let "a sentimental attachment to justice get in the way of an effective legal process", so when a corpse is found floating in the village pond, he accuses the first farmhand to meet his eye and sets about fabricating evidence against him. The innocent Jean Cabot is duly executed as a notorious thief, spy, highwayman and serial killer before an appreciative Orleans crowd. Six month's later, and M. Desalleaux is is a reformed character, noted for his impartiality, lenience, kindness toward humble peasants, and engaged to marry lowly Michelle, the baker's daughter. What could have brought about such a transformation? There he was, happily fitting up a vagrant with the murder of an old woman, when who should pay him a visit but Jean Cabet, or, to be more specific, Jean Cabet's severed head! The experience so unnerved the prosecutor that it caused him to take a long hard look at himself.